Property Size 2,030 sq. ft. This beautifully decorated 3 bedroom, 3 bath home is located in the Villages neighborhood on Seabrook Island. This private gated island community has 3 miles of white sandy beach making it a wonderful place for family and friends to be together. The first floor of the home offers a large open space living room, dining room, fully stocked kitchen, laundry room and full bathroom. The first floor bedroom has twin beds and a bath. The upstairs has two bedrooms, each with a king bed and private bathroom. Each bedroom has a flat screen TV. The back of the house has a deck that faces the Equestrian Center. 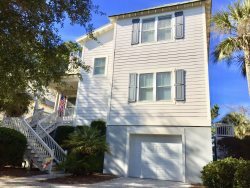 This home gives you access, through the amenity card system, to the Seabrook Island Club amenities and the property owner's Lake House pool and Fitness Center. The Beach Club has an outdoor restaurant and bar, pools, beach access, as well as an arcade and gift shop. The island has two very challanging golf courses. Ocean Winds designed by Willard Byrd and Crooked Oaks designed by Robert Trent Jones. The home is within walking distance to the Club's Tennis and Equestrian Centers and the Lake House facilities. It's a short bike ride on a paved path to the nearby Marina and Freshfields Village. These two spots offer guests of the islands a variety of restaurants, shops, full-scale grocery store and medical facilities, which enhance the appeal of this island oasis. In addition to the quiet beach life of Seabrook Island, historic Charleston, the number one tourist destination in America is only a 30 - minute drive. It is a city that offers the arts and entertainment, shopping, delicious 'low country' dining, carriage rides, the old market, Rainbow Row, and many national historic sites. Relax and enjoy this hidden gem of an island. Convertible bed(s)Upstairs master with king bed and large bathroom. Guest bedroom upstairs with a king bed and separate bath. Main floor bedroom with twin beds and a bath. Living room queen size sleeper sofa.